Diane Rehm. Gibbs Smith (2010). Diane gives an inside look into her life through the story of Maxie, her long-haired Chihuahua. 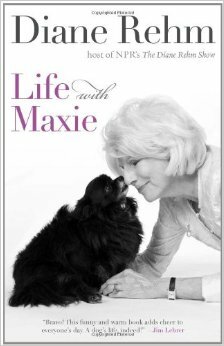 Illustrated with color photos of Diane and her dog, My Life with Maxie tells the story of how Maxie’s presence and sweet personality have profoundly impacted Diane’s life. Fans of Diane’s show and pet lovers everywhere will love this heartwarming story. Diane and husband, John Rehm. Knopf (2002). 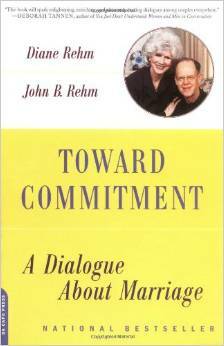 Diane teamed up with her husband, retired attorney John Rehm, for Toward Commitment, a frank series of essays on marriage. With extraordinary candor and generosity, they open up for the reader their decades-long marriage, revealing the strong and passionate bond between them as well as the conflicts and turmoils that can overtake a relationship. They grapple with their pronounced differences of background, attitude, and expectation, so that the reader actually watches them working to understand each other and themselves, and to resolve issues that even after their decades together have remained hurtful and destructive. In 2010, the Rehms celebrated 50 years of marriage. 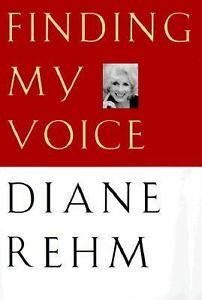 In Finding My Voice, Diane tells the story of her life up through the 20th year of her broadcast career. She begins with her upbringing in a traditional Christian Arab household. Her parents were immigrants from the Near East who had a grocery store in Washington, D.C. After a brief early marriage and divorce, she embarked on a second marriage, to John Rehm, and raised two children. Then, in her thirties, as she found life as a housewife and mother pushing her into depression, Rehm began volunteer work at what was then a small public radio station in Washington: WAMU-FM. She found that she loved radio and was good at it. Six years later she had her own show, hosting politicians, writers, musicians, and scientists for incisive, thoughtful discussions. Finally, Finding My Voice recounts Rehm’s battle with a rare neurological disorder, spasmodic dysphonia (SD), a condition that threatened to end her broadcast career. She was off the air for months searching for a diagnosis and treatment. Today her talk show is entering its third decade. NPR distributes the program across the U.S., where it reaches more than 2.6 million listeners each week. “Diane’s Diary.” Five columns written May 10-14, 1998, for the on-line magazine Slate. “Strangling to Get My Words Out,” Special to The Washington Post, Tuesday, June 16, 1998, Health Section, page H12. Foreword in Washington, D.C., Universe Publishing, A Division of Rizzoli International Publications, Inc., 300 Park Avenue South, New York, New York 10010, 1996. pp. 6-11. “A Tower of Babel: Talk Shows and Politics” in The Harvard International Journal of Press/Politics, Vol. 1, No. 1, 1996. Pub. by The MIT Press, Cambridge, MA 02142. pp. 138-142. “Hot Mouths, Hot Buttons and the Danger to Public Dialogue,” The Washington Post, February 18, 1996, Outlook Section, page C3. “The Tower of Babble: How To Keep Talk Radio From Deepening America’s Division,” The Washington Post, September 11, 1994, Outlook Section, page C1. “We Need A Truth Detector,” The Washington Post, June 30, 1994, Op. Ed. Page. “Talking Over America’s Electronic Backyard Fence” in Media Studies Journal Radio: The Forgotten Medium, Vol. 7, No. 3, 1993. Pub.by Columbia University, 2950 Broadway, New York, NY 10027. pp. 63-69. “Voices of America: The Talk-Show Campaign Isn’t Showbiz: Angry Voters Really Want To Be Heard,” The Washington Post, October 25, 1992, Outlook Section, page C1. “Uncivil Wars: Can We have World Peace With MacArthur Boulevard like This?”, The Washington Post, June 7, 1992, page C5. “Our Masters’ Voices? Talk Show Hosts Should Stay Out Of Politics,” The Washington Post, February 26, 1989, Outlook Section, page C7. “What You Get Is What You Give,” The Washington Post, February 23, 1986, Op-Ed Section, page F8. “A Bill To Be Passed,” The Washington Star, October 21, 1980.